The commissural fibers or transverse fibers are coherent white-matter structures that connect the two hemispheres of the brain. In contrast to commissural fibers, association fibers connect regions within the same hemisphere of the brain, and projection fibers connect each region to other parts of the brain or to the spinal cord. Using Diffusion Tensor Imaging, researchers have been able to produce a visualization of this network of fibers, which shows the corpus callosum has an anteroposterior topographical organization that is uniform with the cerebral cortex. The corpus callosum is a major commissural fiber system in the human brain (along with the anterior commissure). This system is the largest connective structure in the brain, consisting of about 200-300 million axons that connect the two cerebral hemispheres. The corpus callosum is essential to the communication between the two hemispheres. A recent study of individuals with agenesis of the corpus callosum suggests that the corpus callosum plays a vital role in problem solving strategies, verbal processing speed, and executive performance. Specifically, the absence of a fully developed corpus callosum is shown to have a significant relationship with impaired verbal processing speed and problem solving. Another study of individuals with multiple sclerosis provides evidence that structural and microstructural abnormalities of the corpus callosum are related to cognitive dysfunction. Particularly, verbal and visual memory, information processing speed, and executive tasks were shown to be impaired when compared to healthy individuals. Physical disabilities in multiple sclerosis patients also seem to be related to abnormalities of the corpus callosum, but not to the same extent of other cognitive functions. The anterior commissure is another major group of commissural fibers (along with the corpus callosum). Using Diffusion Tensor Imaging, researchers were able to approximate the location of the anterior commissure where it crosses the midline of the brain. This fiber system can be observed to be in the shape of a bicycle as it branches through various areas of the brain. Through Diffusion Tensor Imaging results, the anterior commissure was categorized into two fiber systems: 1) the olfactory fibers and 2) the non-olfactory fibers. Evidence suggests the posterior commissure is a set of fiber pathways that play a role in language processing between the right and left hemispheres of the brain. It connects the pretectal nuclei. A case study described recently in The Irish Medical Journal discussed the role the posterior commissure plays in the connection between the right occipital cortex and the language centers in the left hemisphere. This study explains how visual information from the left side of the visual field is received by the right visual cortex and then transferred to the word form system in the left hemisphere though the posterior commissure and the splenium. Disruption of the posterior commissure fiber pathway can cause alexia without agraphia. It is evident from this case study of alexia without agraphia that the posterior commissure plays a vital role in transferring information from the right occipital cortex to the language centers of the left hemisphere. 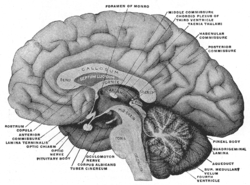 The lyra or hippocampal commissure. Age-related decline in the commissury fiber tracts that make up the corpus callosum indicate the corpus callosum is involved in memory and executive function. Specifically, the posterior fibers of the corpus callosum are associated with episodic memory. Perceptual processing decline is also related to diminished integrity of occipital fibers of the corpus callosum. Evidence suggests that the genu of the corpus callosum does not contribute significantly to any one cognitive domain in the elderly. As fiber tract connectivity in the corpus callosum declines due to aging, compensatory mechanisms are found in other areas of the corpus callosum and frontal lobe. These compensatory mechanisms, increasing connectivity in other parts of the brain, may explain why elderly individuals still display executive function as a decline of connectivity is seen in regions of the corpus callosum. Older adults compared to younger adults show poorer performance in balance exercises and tests. A decline in white matter integrity of the corpus callosum in older individuals may explain declines in the ability to balance. Changes in the white matter integrity of the corpus callosum may also be related to cognitive and motor function decline as well. Decreased white matter integrity effects proper transmission and processing of sensorimotor information. White matter degeneration of the genu of the corpus callosum is also associated with gait, balance impairment, and the quality of postural control. ↑ Kollias, S. (2012). Insights into the Connectivity of the Human Brain Using DTI. Nepalese Journal of Radiology, 1(1), 78-91. ↑ Mulroy, E., Murphy, S., & Lynch, T. (2012). Alexia without Agraphia. Instructions for Authors, 105(7). ↑ Voineskos, A. N., Rajji, T. K., Lobaugh, N. J., Miranda, D., Shenton, M. E., Kennedy, J. L., ... & Mulsant, B. H. (2012). Age-related decline in white matter tract integrity and cognitive performance: A DTI tractography and structural equation modeling study. Neurobiology of aging, 33(1), 21-34. ↑ Bennett, I. J. (2012). Aging, implicit sequence learning, and white matter integrity. Wikimedia Commons has media related to Commissural fibers.